Integrating Zoom with Freshservice improves agent’s communication with a customer by scheduling instant Zoom meeting. 1. 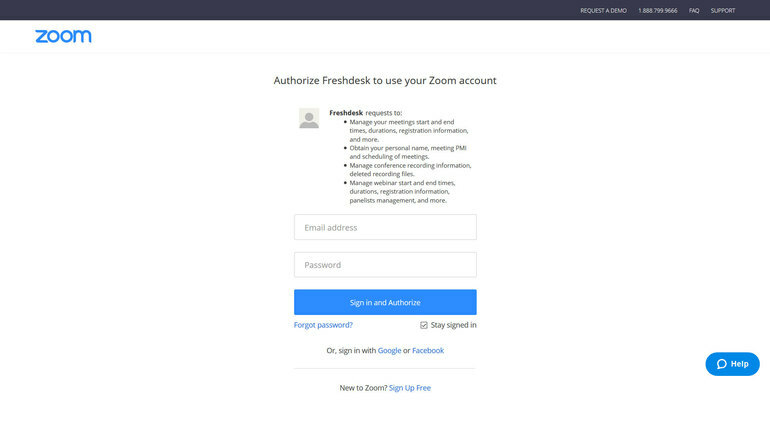 To integrate Zoom with Freshservice, go to Admin > Apps > Get more Apps. Then locate Zoom app in the app gallery and click on install. 3. Now, you can view your Zoom widget right below the ticket sidebar in ticket details page. 4. Click on Generate meeting URL to generate and copy zoom meeting URL in the ticket. 5. Send the meeting URL to the customer. When the customer clicks on the URL, Zoom downloads and installs an applet on the customer’s system. 6. Now, click on the meeting URL from the widget to start your zoom meeting.